I'm experimenting with Direct2D support in Windows 7 using Delphi 2010, and decided to share the output of an example. I'm experimenting with Direct2D support in Windows 7 and Delphi 2010, as I'm working on the chapter of my coming "Delphi 2010 Handbook" devoted to the VCL and Windows 7. After spending a couple of days on the subject, I decided to share with my blog readers the output one of the examples. In this specific case I'm using a round gradient brush based on 4 colors for the background and a very similar gradient for the font brush. I'm also rotating the text with a transformation matrix and dimming it using opacity. The result is depicted in the image below. That's a long way to go from original GDI-based form painting and I have to say Direct2D and the related technologies are really quite powerful. Too bad such a program will run only on Windows 7! I'm wondering if it would make sense to grab all of the output images of the book and post them online (to Picasa, Facebook, or any other picture repository) as images like this make little sense when printed at grayscale in the book. This one I've actually decided to omit from the book altogether. Or maybe get back to the idea of shooting videos for most examples... Back to the book now. black and white versions in the book. Very cool Marco. Looking forward to the book. it depends on DirectX 10, it won't go as far back as XP. other devel tool (VS, Eclipse...etc) ! the format/structure is just great ! freely available for any D2010 owner ? Perhaps you can use one colored example for the cover? 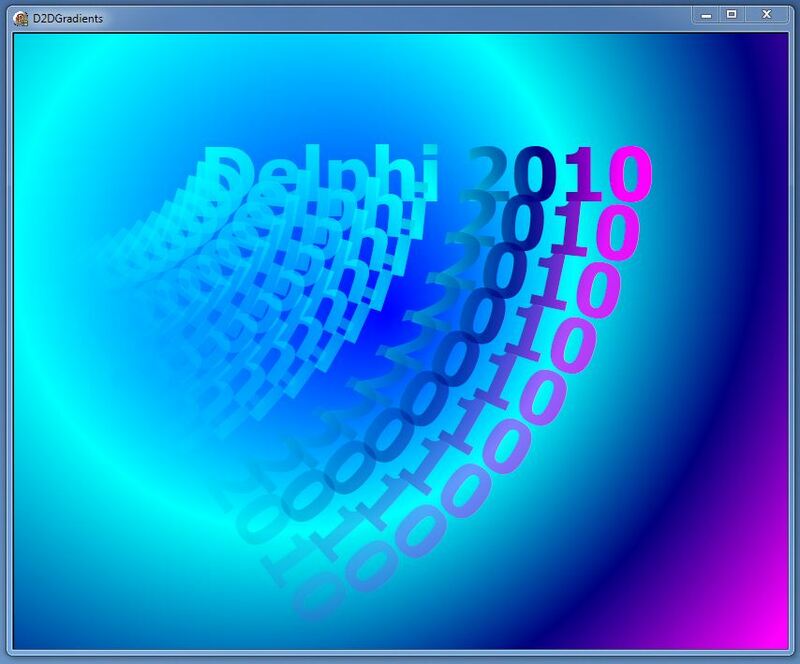 Delphi2010 only attempt to run Direct2d on windows 7.
faster than GDI+ though. Have you tested this? visual quality improvements over GDI and GDI+." hardware acceleration is a great thing.